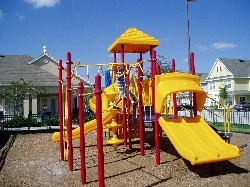 Why spend your hard earned money cramming your family into a motel room when you can have ample extra space for everyone in a luxurious 4 bedroom (sleeps up to 10 comfortably), 3 bathroom townhouse in a gated community right in the heart of the Walt Disney World area of Kissimmee, in central Florida, USA? Our 1470 sq. 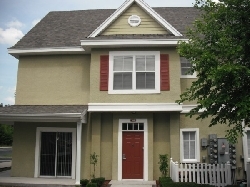 ft. Townhouse includes a main floor bedroom (handicap accessible) with a new Memory Foam King size bed, a private bath and Jacuzzi, with cable TV and DVD player. We also include a Porta-Crib for your child to sleep in at no extra cost. The spacious Living area includes a flat screen cable TV and VCR, 2 sofas (one sofa pulls out for a Full size sleeper bed), and a slider door to our outside wrap-around covered porch. The Dining area is fully supplied with dishes and all eating utensils. The Kitchen comes complete with a new ceramic top stove, oven, refrigerator, sink with garbage disposal, toaster, coffee maker, blender and everything else you may need to enjoy home cooked or to bring in your meals. We even supply a Washer and Dryer for your free use. We have added Wireless Internet for your free unlimited use anywhere inside our townhouse and now free unlimited USA long-distance telephone service. The Upper level has three bedrooms. 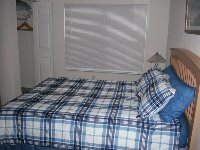 The Main upper bedroom has cable TV, a new Memory Foam Queen size bed, dressers and includes a private bathroom. The two other bedrooms have two Twin beds each, cable TVs and dressers. 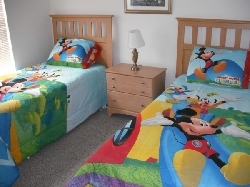 One of these rooms has the new Nintendo Mini gaming system, complete with 30 classic games, for your kids to enjoy. An additional Bathroom is located on this upper level. The Townhouse is fully furnished in tasteful decorations, wood furniture and all the bed linens and towels for your comfort. For cost savings on meals you can eat in or many restaurants and take-out dining areas are located along Irlo Bronson Memorial Highway / Vine Street (the famous Route 192 strip) which is just one block away. We have added folding chairs and tables to enjoy our outside covered porch and a basketball, volleyball, tennis balls and rackets for your enjoyment. The community is located blocks away from a Super Wal-Mart Center, Publix Grocery Store, Super Target Shopping Center, Odd Lots and BJs store. Venetian Bay Village is a Gated Resort Community with a Private Lake, a Recreation/Fitness Center, 4 Pools, Playgrounds, Tennis Court, Volleyball, Basketball, Picnic Areas, a Game Room with pool table, air hockey, pinball and video machines and a childrens movie theater - on site, a Business Center with wireless high-speed Internet, computers and printers for guest use and an On-Site Car Wash facility. We are located Close to all the Walt Disney World Parks, Sea World, Discovery Cove, Universal Studios/Islands of Adventure, Gatorland Park, Medieval Times and many other Orlando attractions. We are located between route 192 (Irlo Bronson Memorial Highway/W. 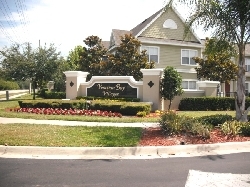 Vine Street) and Osceola Parkway for easy access to Route 4, the Florida Turnpike, Route 528, Orlando International Airport and all Orlando attractions. A 13.5% Florida Rental Tax must be added to the totals. 5 or more nights and NO CLEANING FEE is charged.